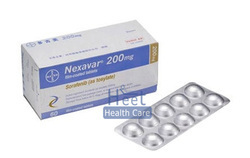 Pioneers in the industry, we offer sorafenat sorafenib 200mg tablets ip, nexavar sorafenib tablets and soranib sorafenib tosylate 200 mg from India. Sorafenib (Sorafenat) is a new medicine used to treat a type of liver cancer called hepatocellular carcinoma, especially in cases where the cancer cannot be surgically removed. It can also be used to treat advanced renal cell carcinoma (a type of kidney cancer) and some cases of thyroid cancer. Sorafenib works by blocking certain abnormal proteins that trigger cancer cell reproduction. 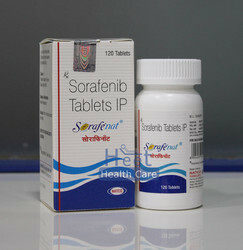 Sorafenib (Sorafenat) belongs to a group of medicines called kinase inhibitors and works by blocking certain abnormal proteins that trigger cancer cell reproduction. Sorafenat will usually be taken at a dosage of 200mg twice daily. Follow the instruction provided by your doctor. Swallow each tablet whole with a glass of water on an empty stomach. Your doctor will outline a timeframe to take Sorafenib. Do not stop taking it early if you begin to feel better. Sorafenib can result in some side effects. The following side effects are common. They will often be mild and temporary. Tell your doctor if they persist. Do not use Nexavar if you are pregnant. It could harm the unborn baby. Use birth control to prevent pregnancy while you are receiving Nexavar, whether you are a man or a woman. Tell your doctor right away if a pregnancy occurs while either parent is taking this medication. Keep using birth control for at least 2 weeks after your treatment ends. It is not known whether sorafenib passes into breast milk or if it could harm a nursing baby. You should not breast-feed while using Nexavar. How should I take Nexavar? Nexavar is usually taken 2 times per day. Follow all directions on your prescription label. Do not take this medicine in larger or smaller amounts or for longer than recommended. Take Nexavar on an empty stomach, at least 1 hour before or 2 hours after eating. Do not crush, chew, or break a Nexavar tablet. Swallow it whole with water. If you need surgery or dental work, tell the surgeon or dentist ahead of time that you are using Nexavar. You may need to stop using the medicine for a short time. Before taking sorafenib, tell your doctor or pharmacist if you are allergic to it; or if you have any other allergies. This product may contain inactive ingredients, which can cause allergic reactions or other problems. Talk to your pharmacist for more details. Before using this medication, tell your doctor or pharmacist your medical history, especially of: bleeding problems, heart problems (such as heart attack, angina), high blood pressure, liver problems.